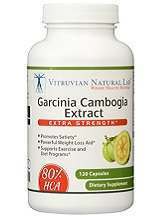 This product review on Vitruvian Natural Lab Garcinia Cambogia Extract provides factual information that can assist customers who are not sure if they should buy this product. It is a 100% all natural weight loss supplement for all body types that works by suppressing the appetite and controls cravings. Also, it aids in burning and blocking fat production, lowering cholesterol levels, reducing cortisol levels (belly fat), and losing excess fat and weight. With the extra strength, this dietary supplement claims to burn fat faster. The active ingredient is Garcinia Cambogia (fruit rind) with this natural extract (75% HCA). It is known to be the best appetite suppressant and fat buster. This product comes in capsules. Adults are advised to take two (2) veggie capsules, 30 minutes before eating, three (3) times a day. Intake must not exceed six (6) capsules a day. They are not intended for persons below 18 years of age, pregnant or breastfeeding mothers, those at risk of or being treated for high blood pressure and heart disease. A bottle containing 180 vegetarian capsules costs $49.99 and comes with free shipping if bought through the product’s website. For a moderate weight loss, the company recommends a 3-bottle package plan for $149.97. The best selling package is a 5-bottle monster plan at $249.95 for those who want maximum weight loss. A review of the feedback left on Amazon by those with verified purchases indicates that some of the problems encountered were horrible headaches, upset stomach, acid reflux, chest pains, and increased blood pressure. Those with diabetes and anxiety disorders are also exposed to higher risk. Vitruvian Natural Lab offers a 100% money back guarantee and risk-free bottles of Garcinia Cambogia in case consumers do not feel that the product is working for them, after having used the product as indicated on the label for 30 days. Also, the company offers free shipping, even if it is just a single bottle purchased through its website. Regarding reviews, both positive and negative feedback are present. The product has an average rating. The manufacturing facility of this product is FDA registered, adheres to the strictest Good Manufacturing Practices (GMP), and is both HACCP and Kosher-certified. Consumers have noticed a spike in energy, less appetite, reduction in belly fat, a great boost in their mood and sleep. Likewise, it has a clear money back guarantee policy and free fast shipping. Some of the critical reviews about this product indicate the lack of changes in the consumer’s body and weight. Another negative comment is the high price per bottle.